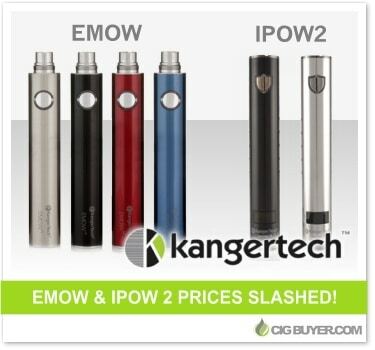 Kanger EMOW & IPOW 2 Batteries – PRICES SLASHED! Looking for an upgrade… or possibly a backup device? The Kanger EMOW is a 1300mAh VV battery that can be switched between 3 voltage settings with several clicks of the button (3.7V – 4.2V – 4.8V). The Kanger IPOW 2 is a larger 1600mAh battery with a unique VW dial on the bottom that adjusts between 3 – 15 watts. If you’re a novice using a mini or eGo-style e-cig, these are excellent upgrades that can bring your vaping to the next level. Likewise, if you’re an experienced vaper with a bigger device, they act as great backups. Normally priced around $25 each, prices have been slashed at Sun-Vapers to clear out excess inventory. Available in red, blue, silver or black, pickup the Kanger EMOW for just $13.99. Or, grab an IPOW 2 in black or silver for just $18.99. Plus, if you apply coupon code “EMOW” you save an ADDITIONAL 7%!